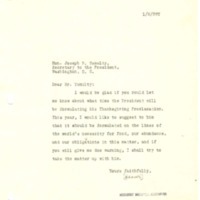 Herbert Hoover asks Tumulty to arrange an appointment for him to speak to the President about food conservation in his Thanksgiving Proclamation. I would be glad if you could let me know about what time the President will be formulating his Thanksgiving Proclamation. This year, I would like to suggest to him that it should be formulated on the lines of the world’s necessity for food, our abundance, and our obligations in this matter, and if you will give me due warning, I shall try to take the matter up with him. Hoover, Herbert, 1874-1964, “Herbert Hoover to Joseph P. Tumulty,” 1917 October 13, WWP19215, Hoover Institute at Stanford University Collection, Woodrow Wilson Presidential Library & Museum, Staunton, Virginia.